Damp Proofing Derby with a vast amount of experience and knowledge in the plastering and damp proofing industry. We are a Local, friendly, family run business. We offer a range of services from a straightforward plastering jobs to cellar conversions and property wall protection with damage prevention and waterproofing to help increase the life of your walls and a finish to be proud of. At Atkins Wallcare we take great pride in our work and guarantee satisfaction with every finish. We cover a wide list of Damp Proofing and Plastering services. For a full list of services click here. Our team consists of one director, Garry Atkin, his brother Andy Atkin and their father, Terry Atkin. 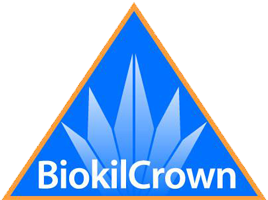 We are Biokil Crown approved contractors who are guaranteed to get the job finished no matter what, no sudden changes in circumstances will affect the timescale or quality of the finished job. Customer satisfaction is among our top priorities, and our work will be carried out at a consistently high level from the initial contract to the finished job, by providing a quality finish, we intend to fulfill this with every job we complete, be it wall maintenance, ceiling render or a change of design, we will ensure you are pleased with our standard of work. We welcome all customers to take advantage of our free, no obligation, quotes in and around Derbyshire and the surrounding areas.